The cuisine of the Chettinad region of Tamilnadu in India is said to be very spicy/hot, if I remember this right. By that yardstick, the Chicken “Chettinad” I made today for dinner does not really qualify for that name. But neither the girls nor I will ever be able to stomach the four dry red chillies that the recipe in Sanjeev Kapoor’s “Khana Khazana” would have required be added to the ground masala this dish needs. So I made it today without any whole red chillies at all. The girls liked the chicken a lot, as did I. It makes a nice change from the usual sort of chicken curry though it is rather heavy because of all the coconut that goes in to it. I’ll take some tomorrow for the boulanger, and see what he thinks of it. I made this for lunch yesterday, since I was looking for a new idea for a curry for the boulangerie. Patrick the boulanger seems to have liked the look of it, though he hadn’t tasted it yet when I went back yesterday evening to ask what he thought of it, since he said he’d like me to make this along with the bread rolls for next Tuesday. The girls did like it a lot though when they had this for lunch with phulkas. I enjoyed making it because it will make a nice addition to the repertoire of vegetarian dishes to cook when friends come over for a meal. Inspired by the decent results from the trial run of the Prawn Malai curry – I made a very small portion to take to the boulangerie for Patrick to taste and he liked it a lot – and prompted by Indira who was very curious to know what sort of curry I am going to make for this Tuesday’s order from the boulangerie, I decided to make the same curry with white fish fillets and the result is very nice too. The fish that I used is called cabillaud in French and that’s haddock/hake/cod in English, I think. We had this tonight with a peas pulav and a small, very fresh-tasting salad of red bell pepper slices and mesclun (the Provencal term for a mixture of young salad greens) tossed in an olive oil, lime juice and basil flakes dressing. The girls said they liked their dinner very much so I am glad I gave this a try. Cut the fillets into 2 or 3 inch pieces. Mix the salt and turmeric in a large bowl and turn the pieces of fish in this mixture gently, to coat them well. In a frying pan, heat the oil, add the bay leaves, fry for a minute, then add the green chilli and the onions and fry till they are a golden color. Now add the ginger and garlic pastes and fry everything for a few minutes till th onions start to turn a golden brown- but without letting the onions burn or brown too much as this will affect the final color of the curry. Add the tomato puree next and once the oil starts to appear on the sides, add the turmeric powder and the red chilli powder and fry everything for a minute. Now add the fish pieces, turn over gently a couple of times to coat them well with the onion-tomato mixture, then pour in the coconut milk and water. Simmer the curry for about 10 minutes or till it has the right consistency (not thin and runny, but it shouldn’t be too thick either). Stir in the garam masala and garnish with fresh, chopped coriander leaves. 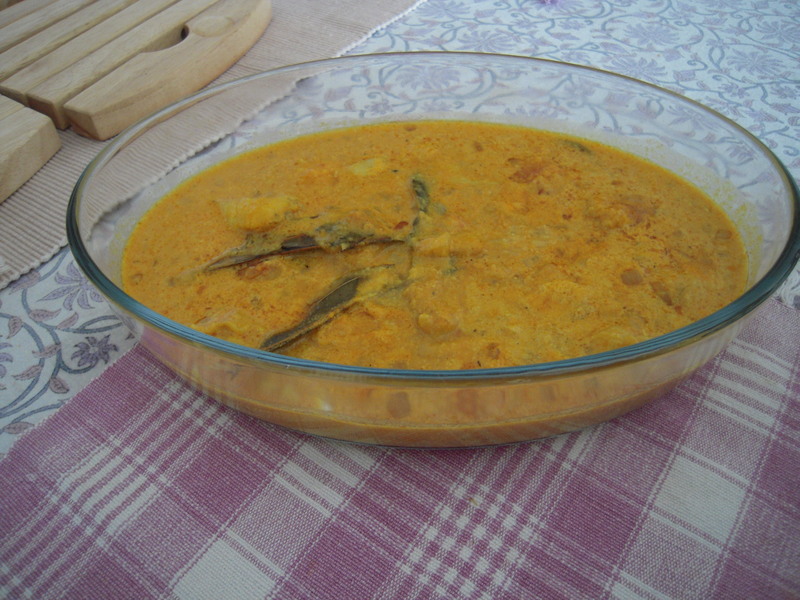 When the boulanger asked if I could do a fish curry for next Tuesday, my first reaction was to tell him honestly that I have very little experience cooking fish. But then I remembered that I made this Bengali curry, which combines prawns and coconut milk, once a long time ago and the girls did like it. He was quite happy with that suggestion when I mentioned it so this is what I am going to make for next Tuesday along with some peas pulav, batata vada, mint-coriander chutney and carrot salad. The classical chingri (that’s Bengali for prawn) malai curry does not include tomatoes I think, but I prefer to make it with them. Soak the frozen prawns in some water for a few minutes, then drain the water and pat the prawns dry. Mix the salt and turmeric in a large bowl and turn the prawns in this mixture gently to coat them well. In a frying pan, heat the oil and fry the prawns till they are a golden color (don’t fry for too long else the prawns can become a little hard). Take them out and keep them aside. In the same oil, add the bay leaves, fry for a minute, then add the green chilli and the onions and fry till they are a golden color. Now add the ginger and garlic pastes and fry everything for a couple of minutes, without letting the onions brown as this will affect the final color of the curry. Add the tomato puree next and once the oil starts to appear on the sides, add the turmeric powder and the red chilli powder and fry everything for a minute. Now add the prawns, stir together everything well, then pour in the coconut milk and water. Simmer the curry for about 10 minutes or till it has the right consistency (not thin and runny, but it shouldn’t be too thick either). Maria, our neighbor from the first floor and the mother of Katia who is in CP in the girls’ school, came over this Tuesday afternoon for a “how-to-cook-a-curry” demo. Carrot salad -which was the other thing I showed her to make, since she and her husband liked it very much at a PTA lunch in December- and jeera pulav on the side made for a nice dinner that evening. The girls love this curry as much as they do rajma or chicken curry and they were quite pleased to find three of their favorite things on the table. The quantity here was enough for the four of us, Maria’s family and there was some left over as well. Warm the oil in a pressure cooker, add the black cardamom and cinnamon, then when their aroma is released add the ajwain seeds and the cumin seeds. When these begin to brown, add the onions and fry at a medium hot temperature till they are golden brown in color. Now add the potatoes and fry these with the onions till the potatoes start to acquire a crisp, golden color and the onions turn quite brown. Add the ginger and garlic halfway through this process. Add the tomato puree next and cook till the oil starts to appear on the sides. Add the dry spices now and cook everything together or another 2-3 minutes. Season with salt, put about 3-4 cups of boiled water and pressure cook for as many whistles as are needed for the potatoes to be soft enough (2-4 whistles are usually enough because the potatoes tend to be half-way there by this point anyway). 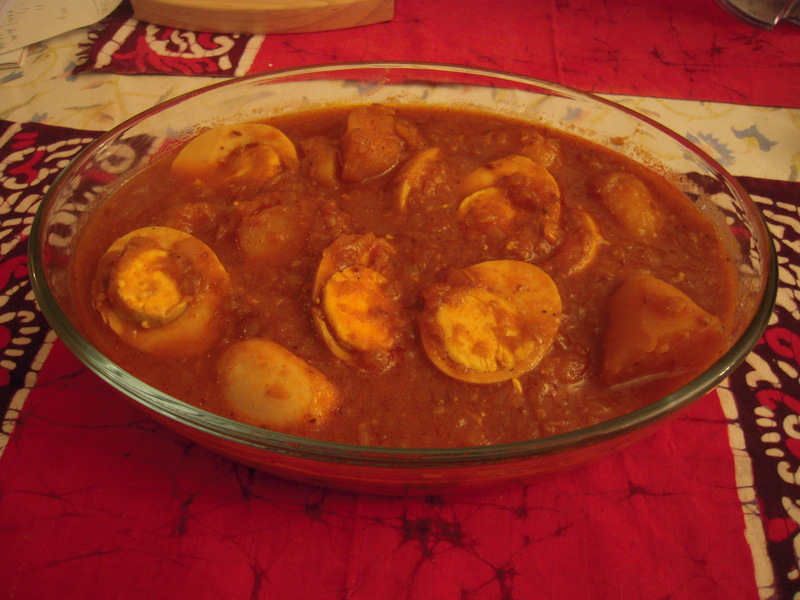 When the cooker can be opened, add the boiled and sliced egg halves to the curry and simmer for 7-8 minutes or till the curry is the consistency/thickness you want, stirring once in a while. Chopped, fresh green coriander makes a great garnish. I have always loved eating the kofta curry my Ma makes with paranthas, though it is something I myself made only very rarely until recently because the thought of deep-frying the koftas made me avoid this curry as not the healthiest choice. But seeing how much the girls and Shri enjoyed the courgette-kofta curry I made a couple of months ago set me thinking again that I needed to figure out how to make the koftas with as little oil as possible. I did know it can be done- Gunchu di once told me that she makes them in the micro-wave oven. So some time ago I decided to carry out a little experiment and baked them instead, as Shri is not too keen on my using the micro-wave oven for cooking. 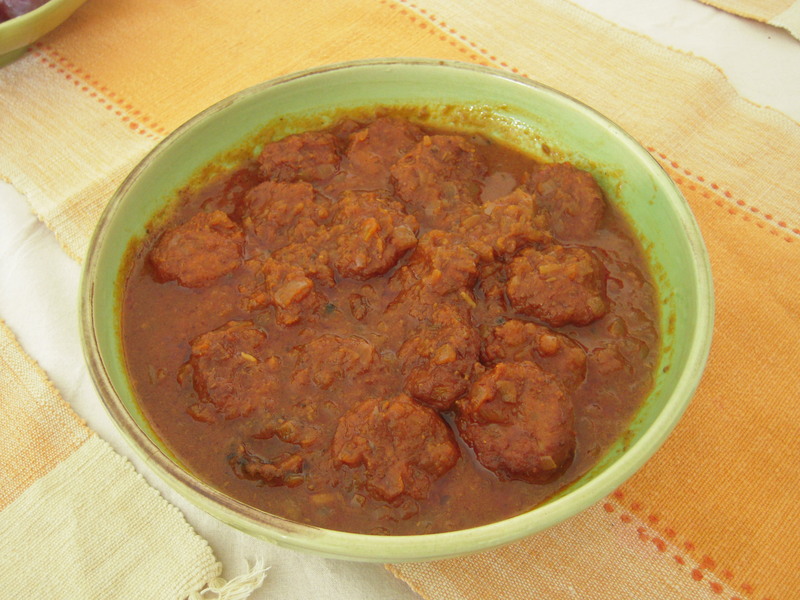 As it turned out, none of them noticed anything different about the kofta curry that evening; so I will be making it like this – by baking the koftas – and therefore a lot more often now ! 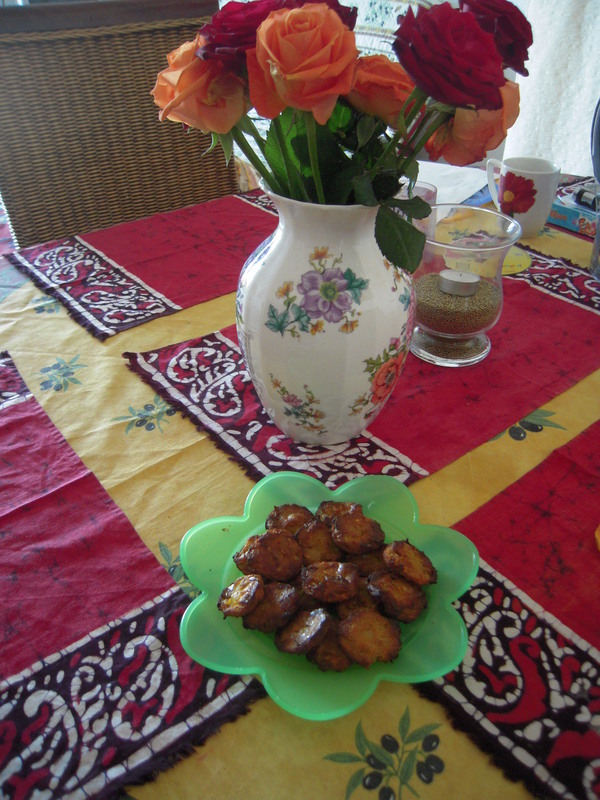 The baked koftas; the roses are from November 6th .